The Professional Regulation Commission (PRC) announced on Tuesday the full list if passers for March 2015 Medical Technologist (Medtech) board exam. 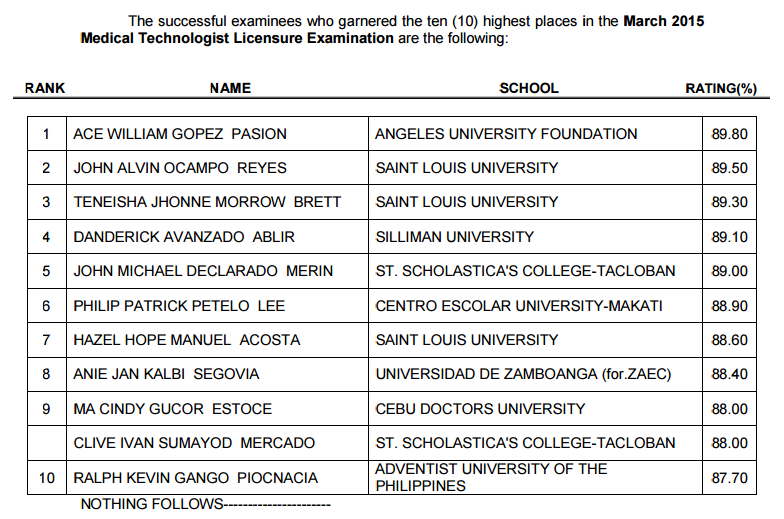 Ace William Gopez Pasion from Angeles University Foundation (AUF), a premier school in Northern Luzon topped the board with 89.80 percent grade. John Alvin Ocampo Reyes and Teneisha Jhonne Morrow Brett from Saint Louis University (SLU) Baguio City placed second and third respectively with 89.50 and 89.30 average rating. PRC said that a total of 1,419 out of 1,942 hurdled the examinations conducted last March 11 and 12 in the cities of Manila, Baguio, Cebu and Davao.